It should be noted, page references that end in “a” indicate the subject matter can be found in the upper half of the indicated page or first section of a given chapter. Likewise page references that end in “b ” indicate the subject matter can be found in the lower half of the indicated page or last section of a given chapter. The use of “Ch” followed by a number indicates the subject matter can be found on all or most pages in the chapter. Italic and bold page references indicate important or very important information, about the subject matter, can be found there. When an omega symbol “Ω” is used next to a page number, it indicates the subject was either killed or destroyed on that page. If a page reference is followed by a question mark “?”, the reference is either unclear, unsubstantiated, or speculation. All page references in the section below are for the 220 page paperback edition “Star Wars® Novelization” - ISBN: 0-345-26079-1, written by Alan Dean Foster, published by Del Rey Books in December of 1976. For the ease of study between sources, many of the names in this list come from newer Star Wars® publication sources and are not specifically called by these names in the novel. Some roles in this novel are represented by different characters and their movie equivalents are noted. Cat: Still looking for references. Corellia: Still searching for references. Stormtroopers drop into the Tantive IV from above in the novel and not from a side pressure door as in the movie. C-3P0 gets stuck in wires on the damaged Tantive IV in the novel as opposed to the damaged Millennium Falcon in the movie. On the Death Star, during the command meeting, in the novel, Tagge is force choked, as opposed to Motti being choked by Vader in the movie. The name of the captain of the Tantive IV is referred to as Captain Colton in the novel as opposed to Captain Antilles in the movie. Luke’s Speeder has a canopy like the Ralph McQuarrie concept art. Clearly Foster’s descriptions were based on concept art which was all that was available to him at the time of writing. Due to difficulties filming with the canopy, it was excluded it from the movie. The novel has Obi-Wan living in a cave instead of living in a house as depicted in the movie. Both Tarkin and Vader interrogate Leia in her cell in the novelization as opposed to Vader only in the movie. Dr. Evazian’s character looses arm in the novel instead of Ponda Baba. It should be noted that Evazian and Baba are very different in the novel as compared to their movie counterparts. Chewbacca stuck around for Greedo’s death in the novel as opposed to him getting back to the ship to get it ready in the movie. Unlike the movie, Ben does not feel a great disturbance in the force with the destruction of Alderaan in the novel. Han shoots the magnetically sealed door in the garbage masher instead of Luke in the novel. The Grappling hook swinging scene with Luke and Leia, over the service canyon, is different in the novel. In the novel Luke makes 2 separate runs down the Death Star Trench and takes 2 separate shots at the death star Thermal Exhaust Port as opposed to 1 run and 1 shot in the movie. As in the Marvel Comic, Chewbacca is also given a medal. “Organs of Commerce” are mentioned. Could this be an early reference to the Corporate Sector Authority (CSA)? Journal of the Whills is first mentioned here and is also referenced in “Star Wars: The Roleplaying Game, Second Edition”, “The Movie Trilogy Sourcebook”, “Star Wars: The Annotated Screenplays”, and “STAR WARS® Chronicles”. R2-D2 is noted as being 1 meter tall. Clearly this is the origin of 1 meter height fallacy found in roleplaying game stats. The actual full-size R2-D2 Prop is 61 x 46 x 110 cm according to “The Best of the Lucasfilm Archives”, page 12, thus R2-D2 is more accurately 1.1 meters tall. There is a discrepancy as to weather the Tantive IV’s “principal solar fin” or “main stabilizer fin” was damaged by the Star Destroyer. Either both terms are interchangeable or C-3P0 was in error and misheard R2-D2’s damage assessment. R2-D2 does not correct C-3P0 so this may just be a simple typo the editor missed. “Fear followed the footsteps of all the Dark Lords.” This quote suggests Darth Vader was but one of many “Dark Lords” operating at the time. This demonstrates the “rule of two” (master and apprentice) was a later fabrication and revision of the Prequels. R2-D2 has trouble walking into the escape pod. Clearly this droid never flew nor could muster any propulsion other than its legs even in an extreme emergency. If R2-D2 was completely rebuilt after the Battle of Yavin, then why don't we see him fly on Hoth or Dagobah if he was designed to fly? Again yet another fabrication and revision of the Prequels. Stormtrooper Armor is described as being made mostly of metal. Later sources describe the armor as “Plastoid Composite Armor”. Clearly a dominant percentage of that “composite” is metallic in nature. Luke is noted as being 20 years old, not 19, not 18 as newer sources indicate. At this point, Luke and Leia’s ages are different or we are led to believe they are different. I suspect Leia’s age was reduced to 18 to throw off any suspicions from the Emperor or Darth Vader and to assist in keeping her hidden if Luke was discovered on Tatooine. Because of this, Mon Mothma may actually be the youngest Senator appointed in the Old Republic Senate after all. Was Biggs on the Tantive IV? Clearly Biggs knew what was going on in orbit of Tatooine but was being evasive and was even trying to cover up the space battle by deceiving Luke. If Biggs was not on the Tantive IV, he might have been on a ship that was going to rendezvous with Leia to pass off the Death Star plans. An interesting choice of words and a subtle clue that Allan Dean Foster (author of “Splinter of the Mind’s Eye” ) not George Lucas wrote the novelization. I can’t help but wonder how much of Foster’s work made up the core of STAR WARS® and if Lucas inspired Foster or if the inspiration was the other way around. Biggs recalls the Empire being great a long time ago but has no memory of its creation. Biggs is older than Luke which indicates the empire is older than the Prequels suggest (19 BBY). Biggs notes that Uncle Owen is very proficient with a blaster. If Obi-Wan Kenobi is Owen Lars’ brother as indicated in the “Return of the Jedi” novelization, then Owen’s abilities should be of no surprise. This clue also suggests Owen was considered Kenobi’s brother from the very start. Was the term Imperial Starfleet inspired by the original “Star Trek” TV series? The novelization notes that the construction of the Death Star took many long years. A need for a planet killing weapon, and an existing evil Galactic Empire to build it, would have both been needed, in place, before construction could have begun. This suggests an older Empire that we fail to see in the Prequels. Allan Dean Foster uses the word “sentience” instead of “sapience” to describe alien beings with higher mental functions, which sets a bad linguistic precedent from the very beginning, and is thus copied erroneously many times by subsequent authors. We learn C-3P0 is programmed not to escape and if he does his systems would melt as a safeguard. This strange technological function requires more study. The Tarkin Doctrine is explained thoroughly and demonstrates that the Death Star was a response to vacillating worlds of the Empire or in other words, rebellious activities. Again an existing displeasure with the conduct of the Galactic Empire would have to exist to motivate rebellion and then motivate a response to that rebellion with a fear weapon (Death Star). Again we encounter another clue that points to an older Empire that we fail to see expressed in the Prequels. Vader makes a sarcastic remark regarding the Emperor which suggests their has been a degree of conflict in Vader’s conscience from the very beginning. This is a subtle clue that foreshadows Vader as being a redeemable villain. The name Obi-Wan is considered A name from another time . Yet another clue suggesting that Kenobi went into hiding much sooner than the Prequels indicated (19 BBY). Uncle Owen is evasive and indirectly alludes to the fact that “Ben” Kenobi and Darth Vader were born at the same time by admitting that Obi-Wan and Anakin “died” at the same time. The Prequels (Episode 3) fail demonstrate a change in Obi-Wan’s name to Ben. We read that C-3PO Pilots Luke’s Speeder. This may have been the influence behind C-3P0 piloting the Millennium Falcon in “Shadows of the Empire” . R2-D2 Jumps with great difficulty with his weak leg springs. No mention nor any attempt is made to fly. No lamentation is made, in any way, at once having the power of flight in the past. Flying astromechs are clearly an afterthought and revision of the Prequels. Obi-Wan’s initial description closely mirrors that of the shabbily-dressed wizard Merlin of Arthurian Legend. This is clearly no coincidence on Foster’s part but is an establishing description mirroring the mythical wizard of Camelot. R2-D2 notes that Obi-Wan Shows signs of exposure to various extreme climates both cold and warm. These are subtle but important clues to the man’s past. Obi-Wan changes his name to Ben. Here, as well as in the movie, his name changed before Luke was born. Episode 3 fails to address this fact completely. Obi-Wan considers R2 to be a “Modern” droid. A strange observation that begs the question, "what does modern mean in this context?" Allan Dean Foster explains in this novelization why C-3P0 later comes apart, at the joints, in “The Empire Strikes Back”. Did George Lucas create the idea of the “Automatic Overload Disconnect” (armature) or did he borrow and expand on the idea from Foster? Ben serves Bail Prestor Organa during the Clone Wars. Both novel and movie state the same thing, Kenobi served Organa during the clone wars. In spite of this, we do not see Obi-wan Serving Organa in any way in the Prequels. Leia’s transmission via R2-D2 indicates Kenobi fought in the Clone Wars and did so “Long ago”. The context is one of desperation because Leia realizes Kenobi must be very old by now. All clues that suggest the clone wars and Jedi purges all occurred much further in the past than the Prequels suggest. We learn Anakin was a farmer just like Luke. Clearly here we have Anakin Skywalker and Darth Vader described as two different people. Anakin is compared to Luke in many ways and Kenobi notes Luke’s many similarities to his father. Both literally by scriptwriter George Lucas and figuratively in the story, a combining of Anakin and Darth’s characters occurred. Many elements on the STAR WARS® Universe mirror the Arthurian Legends. Thus this relationship reminds me of the legends of the wizard Merlin who was a Cambion, half man, half demon. I see no better place to combine characters to resolve issues with continuity in light of the precedents set by the combining of Cray Mingla and Callista (Callista Ming) in “Children of the Jedi” and the attempted combining of the clone of Emperor Palpatine and Anakin Solo that was foiled by Empatojayos Brand in “Empire’s End”. Obi-Wan recalls that Anakin was the best pilot he knew. Obi-wan then compares Anakin’s piloting to Luke’s piloting of small ships. Clearly there is no mention or suggestion of Racing Pods here but of spacecraft piloting and navigation. Again we have a disconnect between the Anakin that Obi-Wan is recalling and the young boy who was Pod Racing in Episode 1. If Darth and Anakin were two different people later combined as suggested above, then the discrepancy makes more sense. Kenobi admits, the force is an instinct. Clearly the nature of the force is much more mystical and sentient (as in possessing feeling) here than the more concrete microbial Midi-chlorians described in the Prequels. Obi-Wan laments that Anakin was a good friend. We see none of this in the Prequels. The main reason for this is because Anakin was Obi-Wan’s friend and Darth Vader was originally just Obi-Wan’s Pupil. When these characters were combined, certain inconsistencies materialized. If Anakin and Vader did combine as discussed above, then the differences of personality and relationship reconcile. Obi-wan speaks of an “Idealistic crusade” he went on with Anakin. Owen Lars protested at this impulsive reckless adventurous deed. This immediately reminds me of Yoda’s critique of Luke’s impatient attitude on Dagobah. Yoda’s criticisms are dulled by the spirit of Obi-Wan who reminds him of his own exploits. The Obi-wan we see in the Prequels is nothing like this and with that revision one of the more exciting character-based story elements was lost with it. Anakin’s Lightsaber is in good shape and save for a few scratches, on the grip, looked new. This suggests Darth Vader, Obi-Wan's apprentice, didn’t use it for long or Anakin just made a new one before he was “betrayed and murdered”. Further study of this subject is in order. We learn Lightsabers are still in use in certain Galactic Quarters. This reminds me of the Tapani Sector and the noble houses still practicing the old traditions. I suspect the “Lords of the Expanse” boxed set by West End Games was influenced by this text. Han Solo knows of Lightsabers but not in this part of the galaxy which suggests Solo spent some time in the Tapani Sector or some similar part of the galaxy that still practices Lightsaber dueling. Again, as in the movie, Kenobi confesses Darth Vader is his own Fault. Perhaps the most damaging revision of the Prequels is the shift in blame from Obi-Wan Kenobi over to Yoda and the Jedi Council for the mismanaged training which led to Darth Vader’s vulnerability in training that ultimately led to his seduction and fall to the Dark Side of the Force. The Emperor is noted in the plural, i.e. “Emperors”. 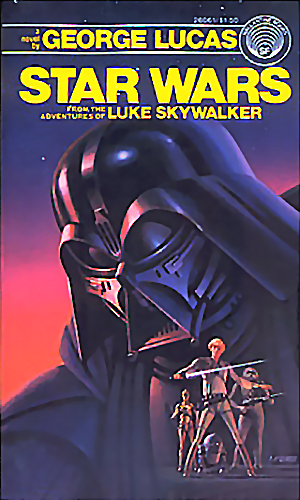 Some may argue this was later revised and this novel was based on an older rough script but decades later in the “Dark Empire” comic series, who’s story treatment was approved directly by George Lucas himself, claimed that Palpatine had cloned his body and transferred his soul into new vessels multiple times. This text agrees with “Dark Empire” and it does not appear to be just coincidence. Obi-Wan remarks he getting too old for “Idealistic Crusades”. This suggests the Obi-Wan of the prequels is too young if the events of Episode 3 occurred 19 years prior (19 BBY). Ben Kenobi speaks Wookiee (Shyriiwook) and speaks it very well. Clearly Kenobi has been to Kashyyyk or has had dealings with Chewbacca and other Wookiees. Sadly neither Yoda nor Chewbacca should have been anywhere near Kashyyyk in Episode 3 but Obi-Wan may have. Jabba’s description in this novel is closer to his “Return of the Jedi” rendering than the Marvel Comic depiction that looks more like a member of the Nimbanel race. Barring the shagginess of his head, the description of Jabba is the same as “Return of the Jedi”. Perhaps Jabba had hair back then but shaved it later on. In the “Glove of Darth Vader” series, Jabba’s father Zorba was fully bearded and had hair on his head as well so there is a precedent for hairy Hutts. The Imperial senate is disbanded on page 35 of the novel but Tarkin is still talking about the Senate’s resistance on pages 116b and 130. This may be just a typo or perhaps Tarkin is speaking about the rebellious exploits of former Imperial Senators like Mon Mothma, Bail Prestor Organa, and Garm Bel Iblis. Clearly Palpatine had to remove Senators of this sort to fully wield absolute power, the absolute power needed to purge the Jedi and to fund projects like the Death Star. The Lightsaber is described as an ancient instrument. Clearly if it’s ancient, then the Jedi purge, that removed most of them from the galaxy, should have occurred well before 19 BBY as it did in Episode 3. The Force is described as magical. This is consistent with Yoda’s statements on Dagobah in “The Empire Strikes Back”. The concept of Midi-chlorians is a stark contrast and revision to this text. Kenobi described as being an “old fossil”. Again the Prequels compressed the timeline of the Old Trilogy and Kenobi somehow ages much faster than Episode 3 can provide (19 years). Leia also knows Obi-Wan as “Ben Kenobi”. This is either a typo or it suggests the House of Organa knew Kenobi changed his name. Likewise if the text is not a typo, it also suggests that Kenobi did in fact serve Bail Prestor Organa at some point and more than likely Organa helped Kenobi hide during the Jedi Purge. As Vader fights with his emotions, he admits to Tarkin that Obi-Wan is the last and the greatest Jedi. In light of this, is it no wonder Kenobi, in his pride and arrogance, thought he could train Darth Vader, by himself, in the ways of the Force? His great talent was no substitute for wisdom. Sadly we see none of this in the Prequels as Kenobi’s blame was shifted to Yoda and the Jedi Council. Alan Dean Foster describes Chewbacca as a “Hirsute Tantalus” which is an interesting reference to Greek Mythology. R2-D2 has an unfortunate “Power socket Blunder” in this novel that eventually appears as a scene in “The Empire Strikes Back” movie. My initial theory is because the novel is based on an older script, I surmise the scene was cut, at the script level, and recycled later in the next movie. Another theory is that George Lucas borrowed the idea from the Expanded Universe for his movie. This is one rare instance where I am more prone to believe the former theory. The great stones of the Massassi Temple are described as Impenetrable. This gives justification to Kevin J. Anderson in “Darksaber” as Admiral Daala bombards the temple from orbit with the Knight Hammer. Luke’s father is remembered by Garven Dreis (Blue Leader/Red Leader) in the fighter hanger on Yavin IV. Dreis, once again, recounts Anakin’s abilities as a starfighter pilot not a Pod Racer. The Deletion of this same scene in the movie and its truncation, editing, and reuse in “A New Hope”, Special Edition has always seemed suspicious in the larger context. I suspect George Lucas was keeping his options open for Luke’s father up to and including the combining of Anakin and Darth into one character this early in the history of the movies. Once again Vader declares “The Force is strong with this one”. Vader has no need of blood tests or Sheet Crystal Sensor Paddles to feel the force-sensitivity in another.